My 4 year old decided he wanted a Grinch Who Stole Christmas Costume 6 months ago. With some help from grandma we created the coolest Grinch costume for him. 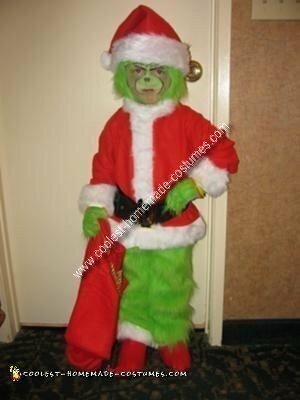 I special ordered some lime green monster fabric and a Santa suit. Then I made some grinchy finger gloves and elf shoes.